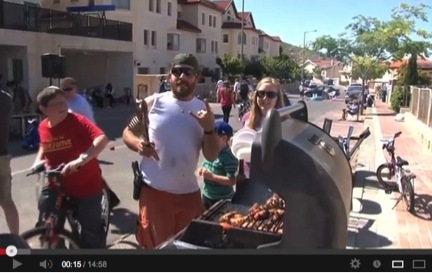 American Jews in the settlement of Efrat barbecue on Israeli Independence Day. “This is freedom,” says the man with the glock. One shabbes in 1973, Rabbi Shlomo Riskin officiated at the bat mitzvah of future Supreme Court Justice Elena Kagan. The ceremony took place at New York’s Lincoln Square Synagogue, a Modern Orthodox congregation on West 67th Street and Amsterdam Avenue. A decade later, Kagan’s rabbi immigrated with a group of his congregants to the West Bank and founded the settlement of Efrat. Riskin, who came from the liberal Jewish stronghold of the Upper West Side, has served as the settlement’s Chief Rabbi ever since. Occupation is more mainstream than you might imagine. Today, Efrat is a popular destination for American Jews. The appeal: a settlement is essentially the ultimate gated community. Across the West Bank, American Jewish immigrants love that their children can play in the streets unsupervised and walk themselves to school. In a stranger-less world of their own, they achieve the American suburban idyll. Theirs is a long white flight. “Efrat combines the services available in a city with the intimacy of a small community,” promises the “community database” on the website of Nefesh B’Nefesh, an organization that partners with the Israeli government to encourage Jewish immigration. The database fails to differentiate between illegal West Bank settlements and towns within the Green Line, Israel’s internationally recognized borders. This is no accident: the erasure of the Green Line is at the heart of Israel’s settlement project. Today, there are over 500,000 settlers in the West Bank and East Jerusalem. In 2010, 269 Jews moved from the U.S. to the settlements (about 11% of the total population of American Jewish immigrants to Israel that year). According to the Israeli nonprofit Peace Now, approximately 1/3 of housing units sold in Israel are actually located in the West Bank—outside of Israel’s internationally recognized borders. Many homegrown settlers are Modern Orthodox Jews. Ever the pragmatists, they synthesize the Zionist dream, a secular state-building project, with divine decree. American Jewish non-profits help pave the way. For example: the New York-based One Israel Fund, which sends 100% of its tax-exempt money to the settlements. They host classy events, like a mixer for young professionals in lower Manhattan, or a backyard garden party fundraiser at a Long Island mansion. Since their founding in 1994, One Israel Fund has given over $20 million to subsidize settler “security” teams, buy weaponry and surveillance equipment, and build playgrounds, schools, and assorted settlement infrastructure. David and Dr. Shari Shapiro of Long Island take part in a One Israel Fund “solidarity” tour of West Bank settlements. “Settler kitsch” is the term I use for the genre of youtube video produced by American Jewish suburbanite settlers and their stateside supporters in institutions like the One Israel Fund. Such videos serve a purpose: masking state violence. Kitsch reinforces what novelist Milan Kundera calls “the dictatorship of the heart.” It is all about feelings. A military occupation doesn’t seem like one when it’s softened by the trappings of home and the family. Could a dad really be an occupier? What could be more normal and harmless than suburban life? Settler kitsch makes the Israeli occupation of the West Bank seem totally natural and inevitable. In November, on the day after the United Nations voted to upgrade Palestine from “observer entity” to “non-member state,” the Israeli government announced its retaliation: construction of 3,000 new settlement homes in the West Bank. The homes are slated for the E1 corridor, which will connect Jerusalem and the settlement of Ma’ale Adumim. E1 will be the final link in the chain that splits the West Bank in two, nixing any possibility of a two-state solution. As President Obama makes his first trip to Israel today, the Netanyahu administration will put settlement construction on hold for a few days. This measure is intended to prevent an embarrassment on par with Vice President Biden’s 2010 visit, when Israel effectively raised a collective middle finger and announced 1,600 new settlement homes to be built in East Jerusalem. Sure, everyone knows that Israel is grabbing up Palestinian territory while calling for Palestinians to “return to the negotiating table” to negotiate said grabbed up territory. The problem was that Israel had strayed from the territorial expansionism etiquette script. But they’re supposed to be a little less flagrant about it. Regardless, Israel has a free pass. The U.S. continues to send $3 billion in annual Foreign Military Financing. As for the homegrown settlers, they tend to live in the West Bank for a variety of reasons, ranging from ideological to what are euphemistically termed “quality of life” motivations. Here are two case studies. Malka Shrybman was tired: of New York winters, Bloomberg, Obama, taxes, the works. Avraham Shrybman felt his first half century of life in America “was just a passing phase” before heading to Israel, where he belonged. In July 2010, Malka and Avraham moved from Far Rockaway to the settlement of Ma’ale Adumim, population 34,000. With lush, palm tree-lined streets (thanks to Palestinian water resources), Avraham swears it’s the Israeli Boca Raton. Ma’ale Adumim welcome sign, via wikimedia commons. Settlement of Elazar, via wikimedia commons. In August 2005, from their home in Teaneck, New Jersey, Alan and Joanne Simanowitz watched the news of the Israeli withdrawal from the settlements in Gaza. “I turned to my wife and said, ‘Look what’s happening to our people,’” Alan remembers. The following July, they moved to the West Bank settlement of Elazar, a close-knit religious Zionist community of 1,800 built on 29 percent private Palestinian property, according to Peace Now. “We felt like we were keeping up with the Joneses all the time,” Alan remembers of Teaneck. But Elazar is a world away. “I look out onto the mountains of Judea–it’s a sight to behold,” Alan marvels. Their main complaint is the six-day week in Israel: the Simanowitzs miss their American Sundays. It was a day of rest, barbecues, and visiting Alan’s family in Forest Hills, Queens. Joanne, too, feels a newfound sense of community engagement. A dance therapist by profession, Joanne participates in Dames of the Dance, an annual charity variety show in the nearby settlement of Efrat. Raised in South Africa, Joanne bristles at those who draw historical analogies. “There is no apartheid here,” she says. There may be settler-only roads, pass cards for Palestinians, and two legal systems: civilian for settlers and military for the occupied. Yet, there’s a new discount supermarket down the road, Rami Levy, where two peoples share one checkout line. Local rabbis, however, have warned against romance blossoming in the aisles. “There’s no miscegenation going on,” the owner assured the Israeli newspaper Haaretz. A native Oregonian, Kiera Feldman is a freelance journalist based in Brooklyn. She has reported for The Nation, n+1, Mother Jones, This Land, and elsewhere. Her work has been supported by The Nation Institute’s Investigative Fund. Follow her on Twitter:@kierafeldman.